When first planning this week’s review, I set my sights on the new LEGO Ideas 21312 Women of NASA kit. Unfortunately, it’s out of stock both online and at my local LEGO store, so that review will be a bit late. In the meantime, I’ve decided to celebrate the release of Justice League with one of the film’s three tie-in sets! 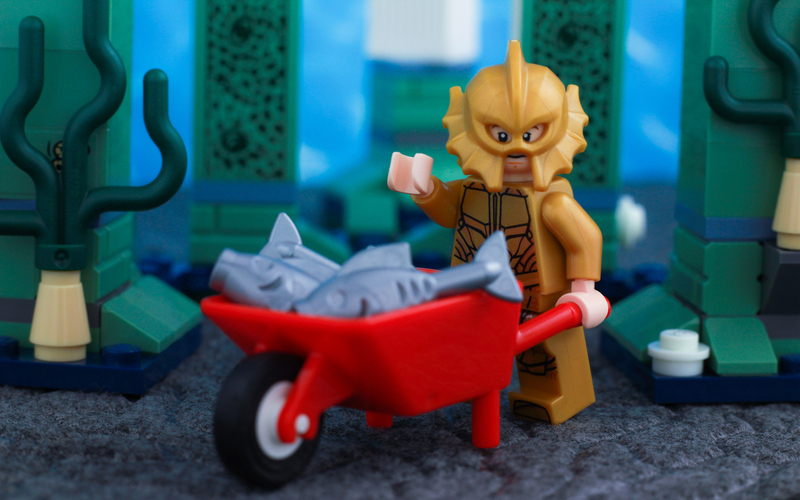 The set in question is 76085 Battle of Atlantis, featuring DC Comics’ iconic ocean dwelling hero, Aquaman. 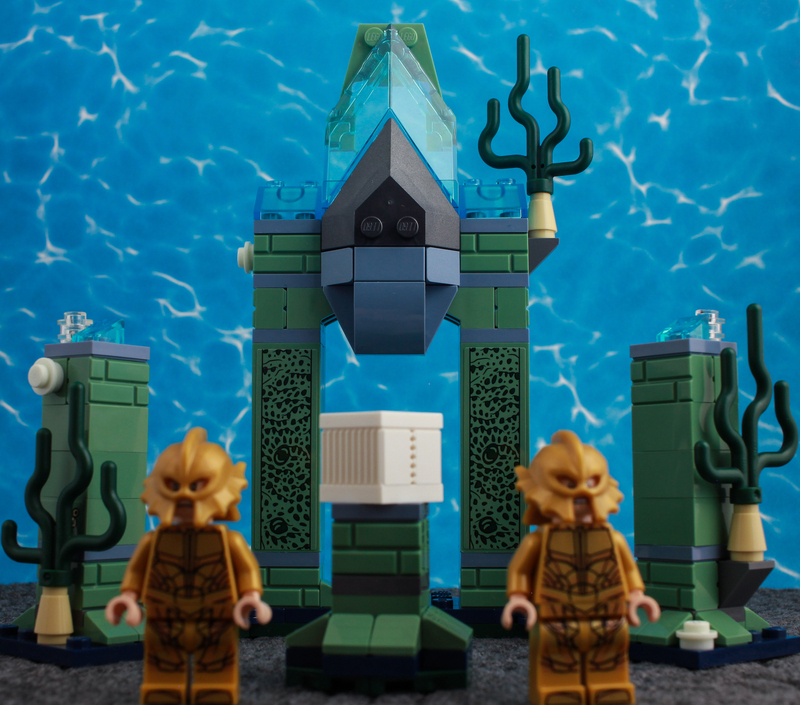 The kit features a small piece of the lost city of Atlantis, where two Atlantean warriors are watching over a Motherbox, guarding it from a Parademon. It uh… all makes more sense once you see the movie. The biggest draw for this set will definitely be its four minifigures. The obvious jewel here is Aquaman himself, as he’s exclusive to this kit. This isn’t your traditional cheesy Aquaman, either, thanks to a more badass makeover. 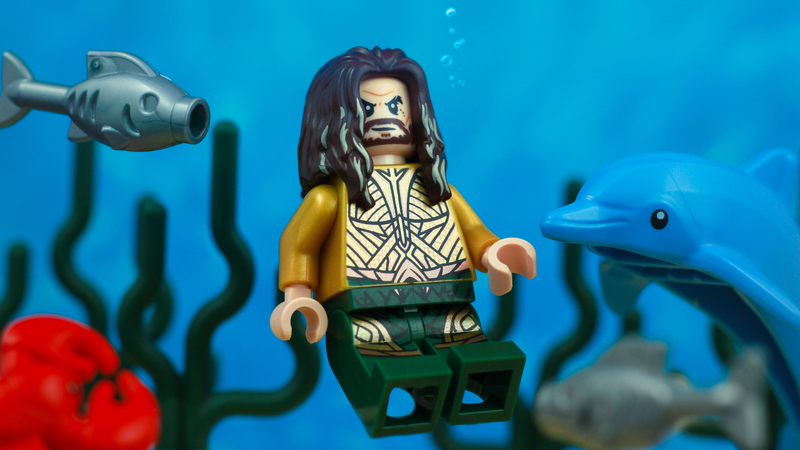 The minifigure is a spot-on translation of Jason Momoa’s likeness, and sports some pretty intricate details, specifically on his armor and hair. I found the Aquaman figure incredibly fun to shoot. Despite the gritty makeover, this protector of the seven seas is still an easy target for jokes thanks to his long pop culture history. 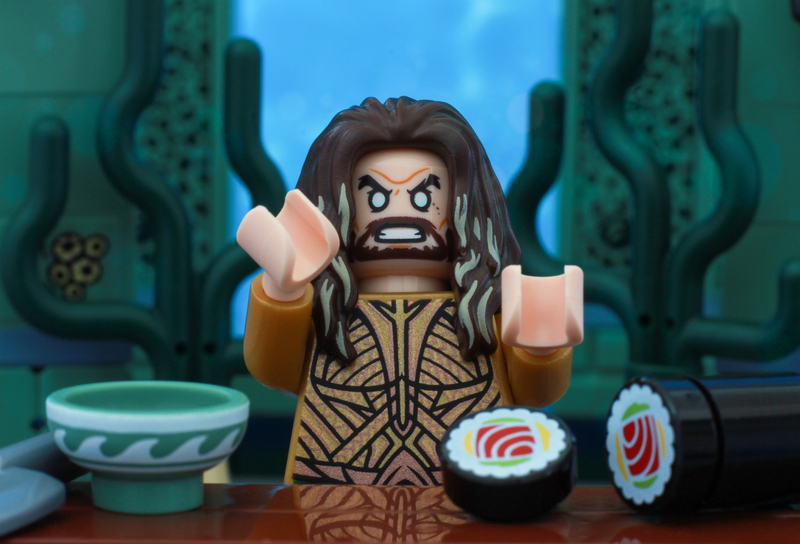 Aquaman was NOT happy to discover this particular surface dweller delicacy! Yes, he can really talk to fish! His two expressions offer much more versatility than I was initially expecting. One side depicts the calm, stoic demeanor you’d expect from a superhero. 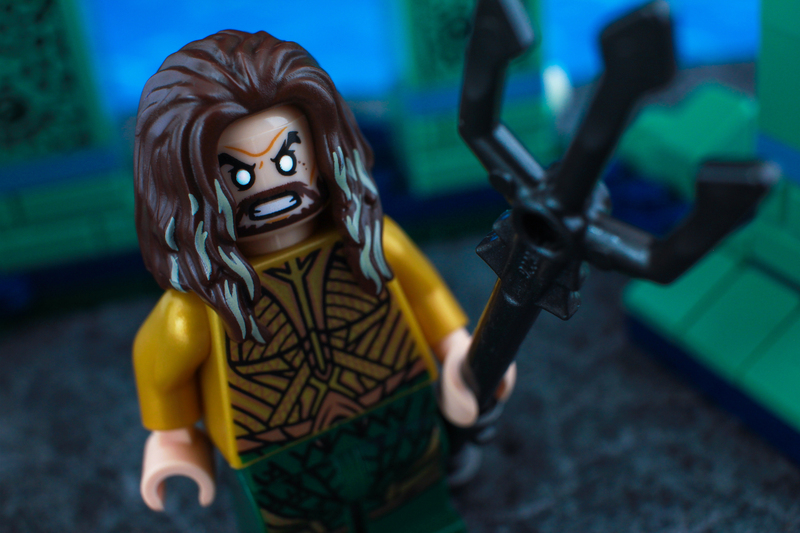 The other portray’s Aquaman’s angry side, which looks especially intimidating with his big white eyes. 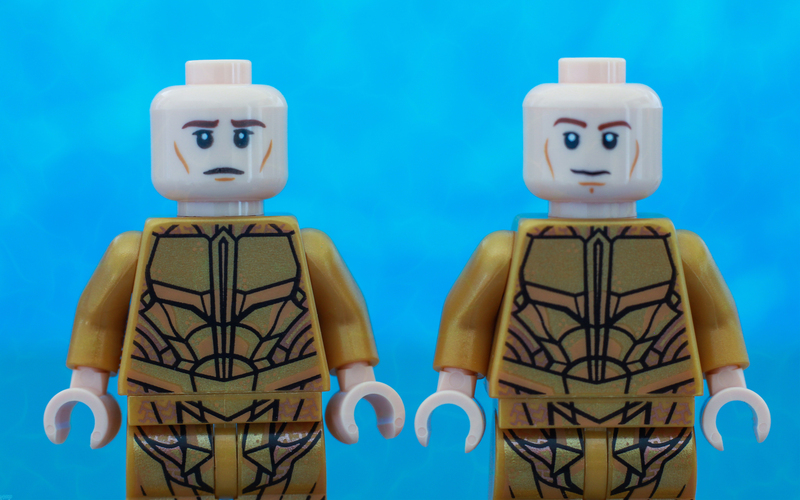 Joining Aquaman are two Atlantean guards, clad in beautifully detailed golden armor and awesome fish-inspired helmets! “Hey Steve, what do sea monsters eat? 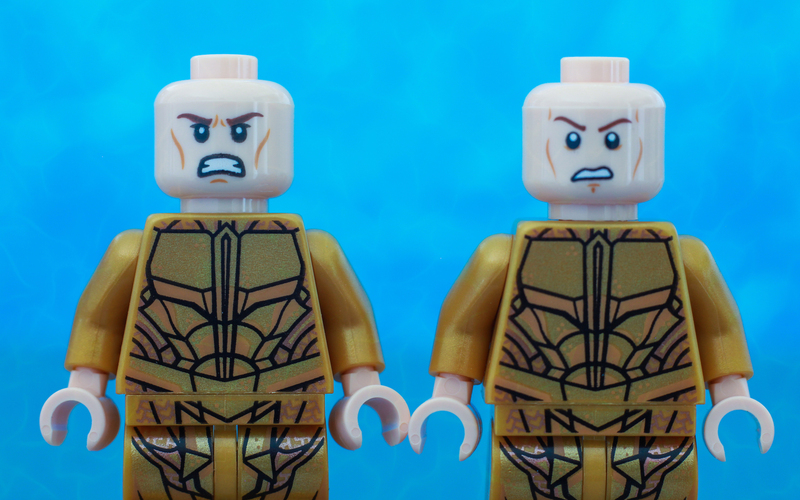 They both have two expressions as well, allowing them to go from neutral to angry and ready for battle. The two guards are armed with white harpoon guns, which look cool but were a bit troublesome to shoot because of their size. The last of the minifigures is the fearsome Parademon, one of the mindless bug-like villains that act as punching bags for the titular Justice League. He too is covered in great details, from his glowing red eyes and gnashed teeth to blue and yellow armored exoskeleton. 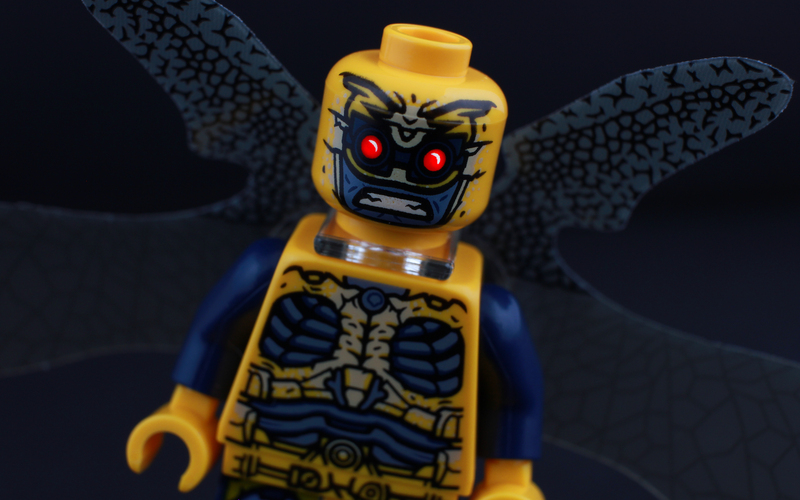 The Parademon gets around courtesy of his four pliable plastic wings, which are adorned with intricate, scaly details. While awesome and fun to shoot, I doubt this minifigure will prove to be a very versatile subject. Such is the nature of being a specific and strikingly different character. I for one am excited to take on that challenge in the future and see what I can come up with. No LEGO Super Heroes set would be complete without some kind of vehicle or structure to offer “playability” for consumers. 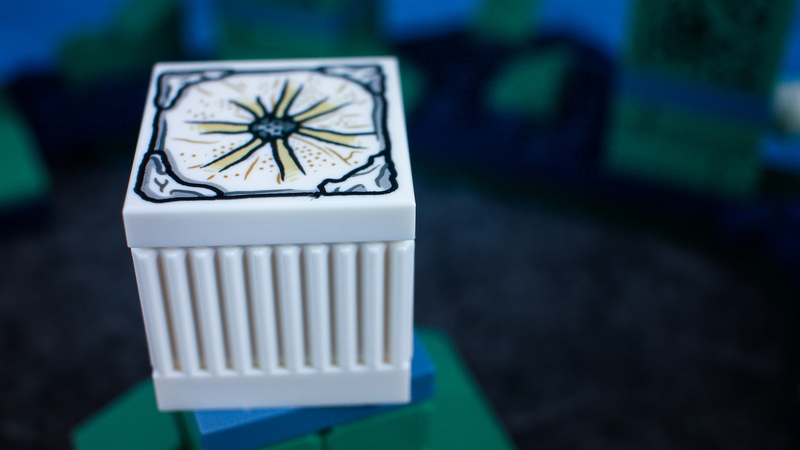 The builds included in this particular kit are a white Motherbox atop a pedestal, and some kind of Atlantean ruins around it. The ruins consist of two small pillars covered in barnacles, seaweed, and a few glow-in-the-dark pieces. The pillars surround an archway that breaks apart. I love the colors on these builds; the sand green and dark blue perfectly suit the underwater setting. I love the detail on the Motherbox, and appreciate that the top tile has been printed on, rather than placed via a sticker. The ruins can be extremely frustrating, as the smallest bump could cause the very top section and two pillars to collapse. That’s by design, which I’m sure is fun for the kids who will be playing with this kit, but it clearly wasn’t made with a photographer in mind. I suggest being extremely careful or making a few sturdier modifications. All in all, I loved photographing this set. I was surprised by how many shots I was able to capture! In total I spent over four consecutive hours in my studio, gleefully setting up a handful of scenarios. I challenged myself with attempting to make each photo look like it had been taken underwater, and I’m very pleased with the results. I’ll be writing about that experience in a future blog post! The ruins themselves are a bit tricky to shoot around, but if placed just right they act as nice set dressing to fill the frame and provide a great bit of background texture. The Motherbox and Parademon will likely end up being too restrictive for much use, but they’re wonderfully detailed for anyone that wants to try. 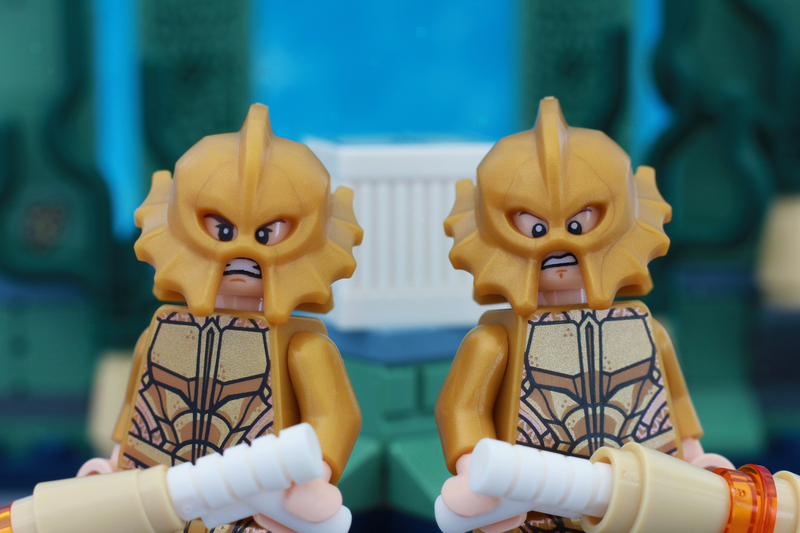 The Atlantean guards have very little screen time in the actual film, so the story potential there is wide open. The Aquaman figure is easily the biggest asset, and I cannot wait to put him in front of my lens again. 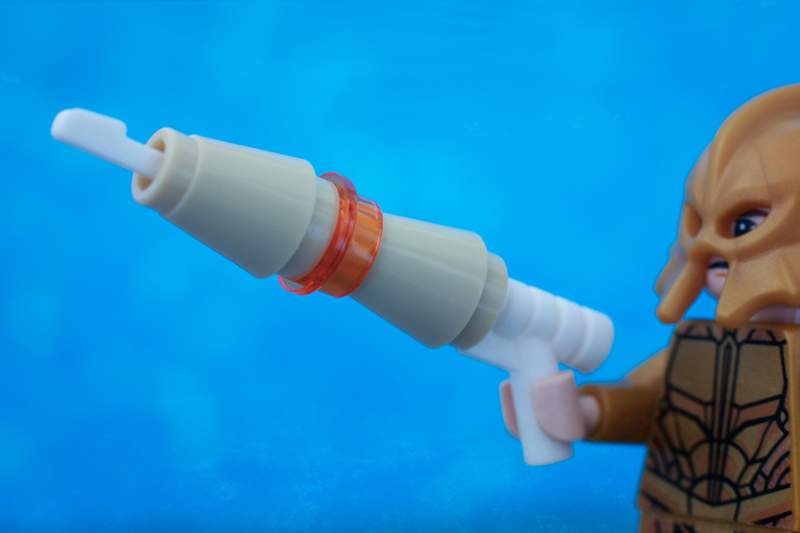 I do wish that a Mera figure had been included, as she’s heavily involved in this particular action sequence in the Justice League film and at this point does not have her own minifigure. Alas, we’ll have to bemoan the plastic gender gap for another day, and cross our fingers that she’ll star in one of the inevitable promotional sets for 2018’s Aquaman solo film. Tell us, have you picked up this set? What photos were you able to capture? Tell us all about it in the comments below. If you enjoy posts like this, we invite you to join our awesome G+ community. And while you’re in the habit of doing things, don’t forget to subscribe to the blog to get notified when we have a new post ready for you! Previous PostThinking of photography – What makes an image? Curse you James! I ended up ordering this set over the weekend just because of those awesome helmets on the guards. While I will probably never see the movie, I’m sure I will have endless fun with this set!